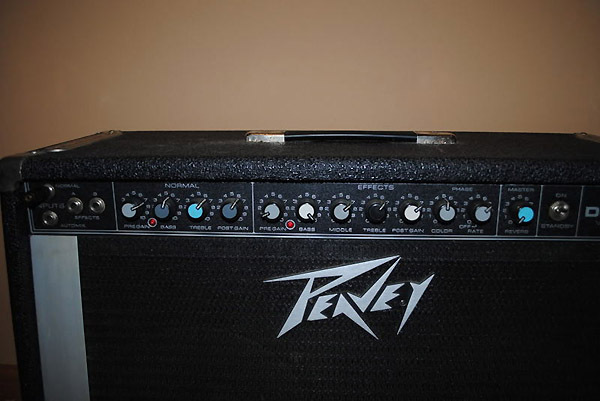 This blog post is not about a Mark Knopfler amp but still has a clear connection to Dire Straits: the Peavey Deuce VT was the amp that David Knopfler played on stage with the band between 1978 and 1979, and thus contributed to the band’s unique sound. 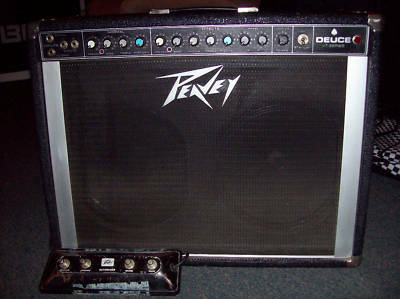 The Peavey Deuce VT was built from 1978 to the early eighties. Before, a similar model called Deuce (without the VT) was available that had – besides various other technical differences – a tremolo effect instead of the phaser. As a combo with two 12″ speakers, it has similar dimensions as the Fender Twin Reverb or the Music Man HD 130 212 that Mark played at the same time. In fact David started to play the Peavey at the same time as the Music Man appeared for the first time, in late 1978. 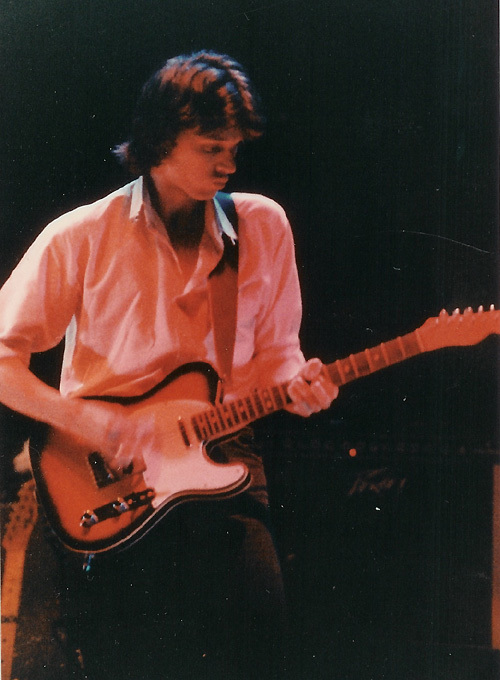 Before (mid 1978) both Mark and David were seen with Fender Twin Reverbs on stage. I assume both were bought together when they felt they needed to upgrade their equipment for the following tours. The Peavey Deuce is – just like the Music Man – a hybrid amp which means the pre-amp stage is solid state, while the power amp has four 6L6 tubes. Today solid-state is considered to be inferior because of the harsher distortion compared to a tube, but back then it was almost high-tech, considered to be more reliable than an all tube design – no crackling noises, no whistling pre-amp tubes, less danger for a failing tube in the middle of a performance. The amp is bulit like a tank, solid and heavy, suited for professional usage on big stages. While Mark’s Music Man is basically an upgraded Fender Twin Reverb, with the same controls, the Peavey Deuce VT has its own layout: two channels (Effects and Normal) , built in reverb (works on both channels) and the phaser effect (effects channel only). On the left we find four input jacks, two for the effects channel, one for the normal channel, and one to use both channels (together or switchable with a foot switch). The Normal channel has a control for pre gain (gain before the EQ section), bass, treble, and post gain (after the EQ section), the Effects channel has controls for pre gain,bass, middle, treble, post gain, and color and rate for the phaser. The phaser of the Deuce VT is said to be really good sounding. 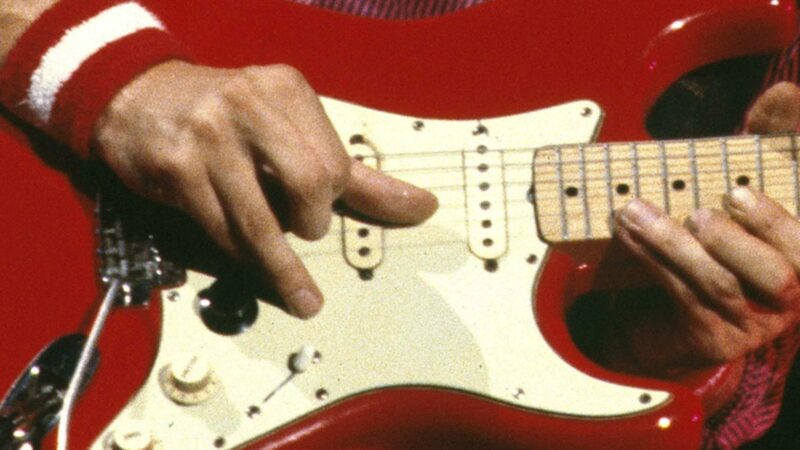 The phaser we hear live on the songs Down to the Waterline or Once Upon a Time in the West might be from the Deuce, but some sources also claim that a MXR stomp box was used for this matter. However, many pictures from this time seem to prove that David’s guitar cable went directly into the Peavey, so live it should come from the Deuce. Finally we have a Master section on the amp that has only one control for the reverb which affected both channels. The four 6L6 tubes creates an output power of 120 watts. Most amplifiers in the pre-amp section are ICs (TL 072 or 478). The amp was optionally available with heavy-duty speakers called Black Widow. These are much heavier, more solid and can handle more power than the stock speakers. I know from David himself that his amp had these. Great to read all this stuff! Thanks and a great site two!! I’ve had my ’79 VT since 93 or 94 and lugged the heavy beast to many practice sessions and gigs throughout the 90’s. It’s got a couple of Celestion G12-80”s, a boxer fan to keep things cool and the original foot switch. A very durable amp and loud as hell. Never had a problem with it in the thousands of hours it’s been switched on since I bought it and it was 15 years old then and 35 now except changed the tubes for the first time a few years ago to GT’s as the old Sylvana’s were going blue. Sounds just sensational on clean with a strat on 7 or 8 through a tube screamer, one of the best blues tones I’ve gotten out of any amp. She mainly sits in the man cave these days with 3 other amps so doesn’t get much use but I just can’t bring myself to part with the old girl. Always good to crank ‘er up every now and then. nice article and good information. i have the Deuce VT with the 212 Black widow speakers. this amp has been virtually unused over the years and it still sounds great! I hate to say it but i am considering on selling it as i am not a lead guitarist or do i use an electric much these days. I have two Deuces’s. One for home an one for where I gig. I will never pert with them. Just found The Deuce VT at a community yard sale this past Saturday. The guy had the Deuce and a nice 80’s Peavey pa system. He said he had not used either one in many years. He wanted $1000.00 for both. Come on guy, it’s a yard sale. I was able to pull the Deuce from his unwilling little hands for $200.00. It is very vlean with no dents or dings and the original footswitch and stock speakers. When I got it home, and received help from 2 men and a boy to carry it from the car to the living room, I fired it up and OH YEA! It blew the dog clear across the room!I will never need that much power. I like the 120 watts RMS it delivers!!! It gives nice head room to produce sweet sounds at lower volume. I am very happy with it. Very quiet and everything works! Oh yea, the dog’s OK! He just now runs away really fast when I power up the Peavey. I just picked up a 1980 Peavey Deuce VT 212 that was bedroom kept along with the original footswitch. The original sales docs, warranty registration & owners manual were also inside the amp!! There is not a mark anywhere on this old girl. Played it last night for 2 hours switching between the Normal and Effects channels. The Automix feature was like an overdrive when mixing in the distortion form the Normal channel with the clean sound of the effects channel. The Phase effect is really rich and lush sounding. You can also get a great tremelo effect when turning the rate on the Phase to higher settings. The amp is obnoxiously LOUD if you turn up the Post Gains!! It’s the best $200 I’ve spent on an amp in a long time. These old Peaveys are built extremely well and are by far better than most amps built today. In the past people bashed them because of the SS preamp section and inability to dial in a smooth singing sustain but with today’s stompboxes anything is possible. I think these amps are going to go up in value as more people are starting to realize the capabilities of these hybrid Peaveys. There’s a reason Lynyrd Skynyrd used the Deuce and Mace accross the stage! Just picked one up in great condition with Black Widows for $140 total! Glad to read the rave reviews also the durability, sounds great so far! I bought a Peavey Deuce brand new back in 1978, and have it for sale asking $300.00, it is in great shape, never been played real load, and actually hasn’t been played that much, reason for selling is the band we were forming back then fell apart, it plays to loud for practicing, to heavy, and I am looking for something I can plug earphones into to practice and play in my bedroom. I have not played it over the #3 gain level. Just picked up a Peavey Heritage w/scorpions. I love it $185. So I went back and ordered a Peavey Deuce after reading these post. I got that for $280 w/ Black Widows but no foot switch, hope to have it by the end of the week. I also had (3) Fender twins and my Heritage blows them away. I also have a Peavey Duel and a Triumph 60. It’s a cracking amp, had it serviced and sounds amazing – wonderful cleans. Far too poweful for my needs really – but it’s going nowhere! Thanks for providing this interesting info, I think it’s great amp – I want to strip the cabinet – are they all pine cabinets? Got given a 1978 Peavey Deuce VT that had been sitting around in a warehouse or something. Needs a bit of work but very excited!